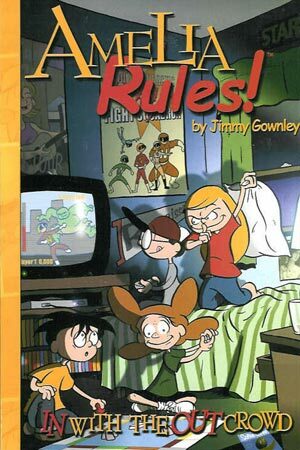 Jimmy Gownley on Amelia Rules! 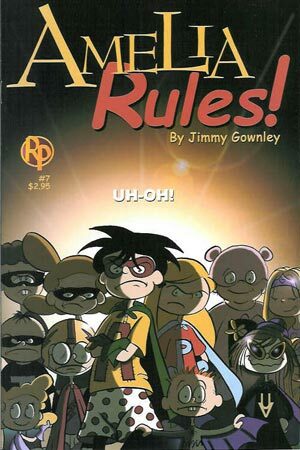 Fans of fine indy comics were more than a little disappointed when Jimmy Gownley decided to close down Shades of Gray towards the end of the 90s. Many wondered if we'd lost another burgeoning highly-original talent to the commercial art market or Hollywood. 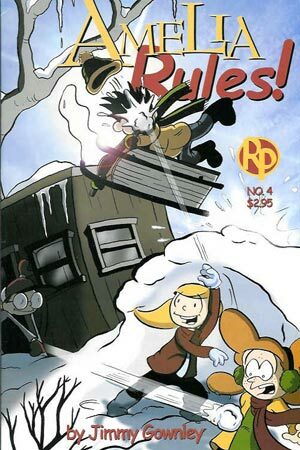 So when Gownley reappeared right around the turn of the millennium, having reinvented himself [if only slightly] as the co-publisher of a new imprint, Renaissance Press, and as the purveyor of a new, blatantly kids-friendly comic called Amelia Rules!, many long time observers of the scene rejoiced. With good reason, it turns out. Amelia Rules! quickly proved it wasn't just a watered-down version of his past work, a Shades of Gray-lite if you will, but something that was new, vital and powerful, despite being solidly based in the rich tradition of thoughtful-yet-fun milieu of children's literature. Furthermore, Amelia doesn't just build on Gownley's considerable abilities to create situational humor and weave poignant, telling tales which reveal as much about our mutually shared humanity as the natures of those characters involved; rather, it expanded on those talents and allowed him to stretch new muscles in service of both entertaining and touching the hearts and minds of his readers. Or, to put it another way, If Amelia does indeed rule, it's all because of some deft and loving string pulling by Mr. Gownley. Bill Baker: OK, who's Amelia, and who and why does she rule? Jimmy Gownley: Who is this "man", and why is he "Super?" Who is this "girl", and why is she so "invisible?" I wish I had a better answer for this type of question. It's a high concept world, and I'm as low concept as you can get. I wish I could say ..."She's a nine year old girl. He wears nothing but pajamas. They fight crime." But the truth doesn't make a great sound bite. Amelia is a young girl, who comes from a broken home. As far as why I think she rules ... I would suggest people buy an issue and find out. Most people who have, haven't regretted it. BB: Where'd the inspiration for the series come from, what was the development process like and how long did it take for Amelia Rules to assume it's present shape? JG: There was a long development period for Amelia. I got the idea for the series when I was still working on my previous book, Shades of Gray, sometime around 1997. I just doodled a picture of a little girl because I was contemplating doing something with a lighter touch -- preferably a kid's strip. It was over the course of the next few years that I really developed the characters. 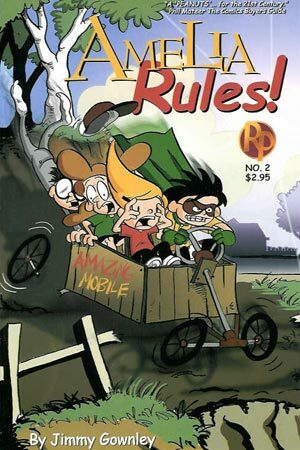 Some of them, like Tanner and Reggie, took a very long time to develop, and others like Pajamaman arrived in a flash and remain untouched to this day. 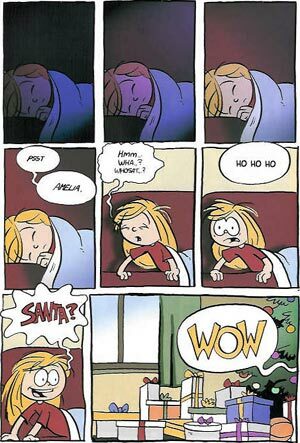 As far as inspiration goes, what I wanted was an intelligently done strip that truly could appeal to kids and adults. BB: Does the issuing of these trades signal an end to the ongoing comic series, or does it in fact help enhance or support the book's life as a periodical? JG: I hope to continue doing the individual issues for some time, but I think the industry has moved and will continue to move more toward trade paperbacks. Ideally, though, they both enhance and support each other. BB: How'd the opportunity to reissue the trades under the auspices of a traditional book publisher come about, what were some of your major concerns surrounding that possibility, and what finally convinced you to take up the offer and run with it? JG: We were approached by Byron Preiss, the publisher of iBooks, at the 2002 San Diego con. His iBooks company, while independently-owned, acts as an imprint of Simon & Schuster. He expressed interest in collecting the first ten issues into two trade paperbacks. The appeal to me was that we could reach a larger bookstore audience with work that had already been created, and to do so in a way that didn't require an additional investment from Renaissance Press. To be honest, the comic book marketplace was a great place to Amelia to start, because the direct market allows for self-publishing, which is an amazing opportunity. However, Amelia is not the type of book that the majority of comic book stores gets behind and pushes. Its appeal is primarily to children, and in particular girls. These are two groups that the majority of [comic] stores seem hell-bent on driving away. Having said that, there have been stores which have been tremendously supportive of Amelia, and I think that any store that goes through the extra effort of promoting books like mine are often rewarded with an expanding clientele. My concerns with doing this were that I didn't lose my copyright, that the contract was for a finite period and a finite number of books, and that the publisher would put their best foot forward in promoting Amelia and helping it reach its intended audience. I think iBooks is doing a great job so far and I can't wait to see what they do with volume 2. BB: It seems like you've been walking a tightrope of sorts with the book right from the beginning, mixing the "Kids Say [and do] the Darnedest Things" aspects of the series with a darker -- or at least more serious -- vein by portraying the various social, familial and other troubling hurdles that confront kids today. What lead to your decision to pursue some of these subjects in a "kids" book, how difficult is it for you to create and develop and interweave those serious themes into the lighter elements of the book, and more importantly, why deal with these issues at all? JG: When I say a "kid's" book, I'm thinking of the type of work I enjoyed as a kid. Books like Harriet the Spy, The Outsiders, and others all dealt with serious themes. Remember, The Adventures of Huckleberry Finn was written as a boy's adventure story. Also, it's important to remember that kids live in an adult world. A reviewer once criticized Amelia for including issues like divorce, or the death of a loved one, and said that children weren't prepared to deal with these themes. But the truth of the matter is, millions of kids deal with these things every day, but they don't have a voice that's speaking for or to them. I think the reasons things of this nature aren't addressed in children's entertainment in general are: 1) adults seem to forget what their own childhood was like, and treat writing kid characters as if they're writing an alien species, and, 2) The vast majority of kid's entertainment these days exists solely to sell them products. An executive at a major animation studio actually told me that Amelia contained too much content, and that girls don't need content. Girls only need a cute icon, which would make them want to collect merchandise. I think people like that are jerks. Total, unbelievable jerks, and I feel bad that they are the gateway through which children receive their entertainment. BB: I suspect that there's a fair number of folks who will agree with that assessment. 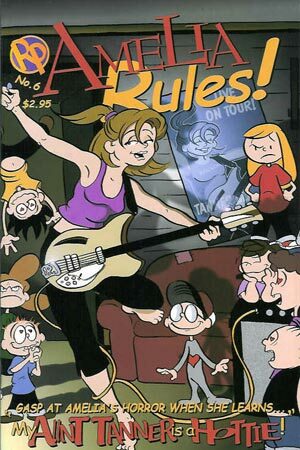 However, getting back to our main subject, how's a typical issue of Amelia Rules! created? JG: I create comics the "Marvel Way" -- which is insane, when you realize I have no collaborators. I get the germ of an idea, and I discuss it with Michael [Cohen], my editor. Then I start drawing randomly, out of order, and with no dialog. At the end I go back and write all the dialog in one shot. I can't really say that I recommend anyone work this way, but there you go. If there's anything I can say about it, it's that I believe it allows me for more spontaneity in both the writing and the art, and gives me time for an extra polish on the dialog before it goes to press. On a technical side, I draw the pages at approximately 9x12 on Strathmore 500 Bristol board. I pencil it with a mechanical pencil and ink it with a Hunt 512 crow quill. Then it's scanned into the computer and colored in PhotoShop, where I also do the dialog lettering. The display lettering is done at the drawing board at the time of penciling. BB: What's coming up in Amelia's world in 2004? JG: In 2004, I'm working on the "Superheros" storyline, which is the first-ever continuing Amelia storyline. I really hope to expand what people think of as a "kid's" comic and write a story that's more in line with what I consider to be quality juvenile fiction. BB: Do you have any plans or yearnings to do other titles, whether it be original or work-for-hire, or will this book be occupying the majority of your time? And I've got to ask if we'll be seeing a revival of Shades of Gray anytime soon? JG: This occupies more than all my time. Having said that, I do have a vague idea for a sports/romance comic that I'd like to do someday, and of course I'd like to finish Shades of Gray, but those are just vague plans. Right now I'm focusing on Amelia and spending as much time as I can with my wife Karen and my beautiful new twin daughters, Stella and Anna. BB: Aside from all the money, mansions and other symbols of lavish success, what do you get from doing Amelia Rules!? BB: What do you hope your readers and fans get from your work? JG: I hope that kids in particular get the same pleasure from my work that I got reading the comics and books that I loved as a kid. Also, that they appreciate the story that's being presented to them by someone whose primary goal is to be just that, a storyteller. For the adult readers, I hope they appreciate the craft that I try to bring to the work and maybe get them to think of their own kids, or children in general, in a slightly different light. JG: I'd like to the a moment to publicly thank both Megan McDonald and Mark Crilley for taking the time to write such wonderful and flattering introductions, and to thank Byron Preiss and Steve Roman at iBooks for their continued efforts for Amelia. And as always, Michael Cohen and Karen Gownley who work very hard to make sure I stay on track, and that Amelia makes it to those wonderful comic stores. For more information on the work of Jimmy Gownley, what Amelia and her pals are up to, or to purchase copies of this quite brilliant series directly from Jimmy so he can keep those lovely twin daughters in nappies, head on over to www.AmeliaRules.com right now. To check out the other excellent graphic novels that iBooks currently offers, or for the latest news on what they'll be doing next, head on over to http://www.komikwerks.com/ibooks_index.php. Finally, you can pick up the Amelia Rules! The Whole World's Crazy graphic novel here.